Most car drivers define basic vehicle maintenance with changing oil, rotating tires, and refilling fluids. While basic mechanical maintenance is necessary to vehicle ownership, physical maintenance is just as important for preserving your ride. 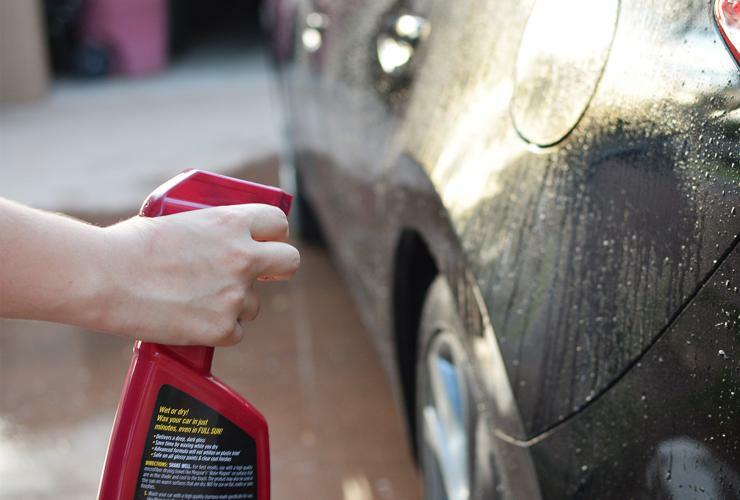 Individuals who keep their car clean with trips to the automatic washer are unknowingly swirling their car’s finish, and missing a chance to preserve their investment. 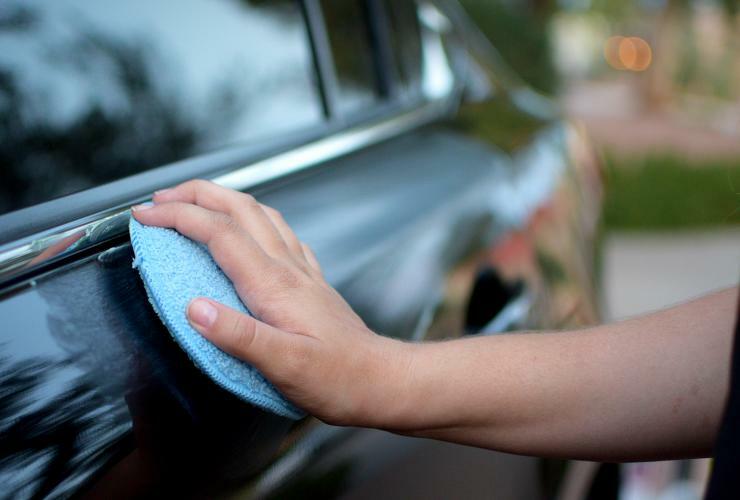 Auto detailing is the act of properly cleaning and protecting your vehicle’s physical condition. Detailing can range anywhere from basic DIY practice, up to professional “show-ready” jobs and paint corrections. We will be going over how you can easily get acquainted with properly maintaining your vehicle. Access to a water source, preferably a hose with a water-jet nozzle. 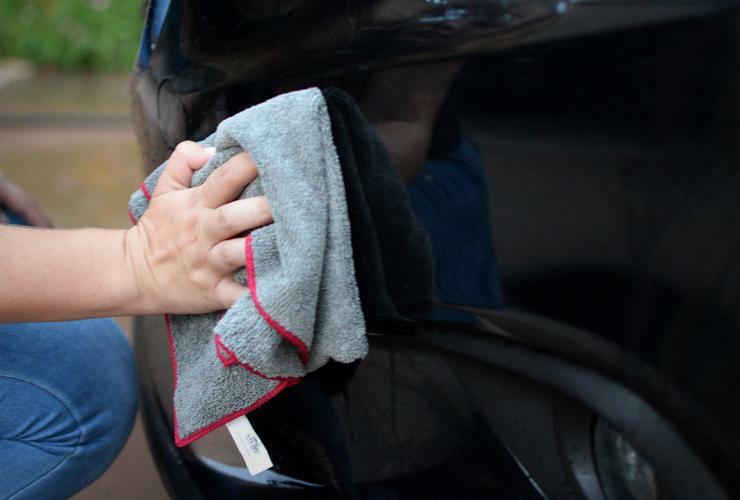 Microfibre Cloth( x5 or more) Note: Microfibre cloths are the most important tool you will use while detailing, and it is wise to buy a higher quality cloth to avoid paint swirling. When everything is ready to go, we can get started on the detail itself! Be sure to set aside 2-3 hours as this is a time consuming process, even more so for someone just starting out. We also recommend doing the detail in a shaded area, or on an overcast day. 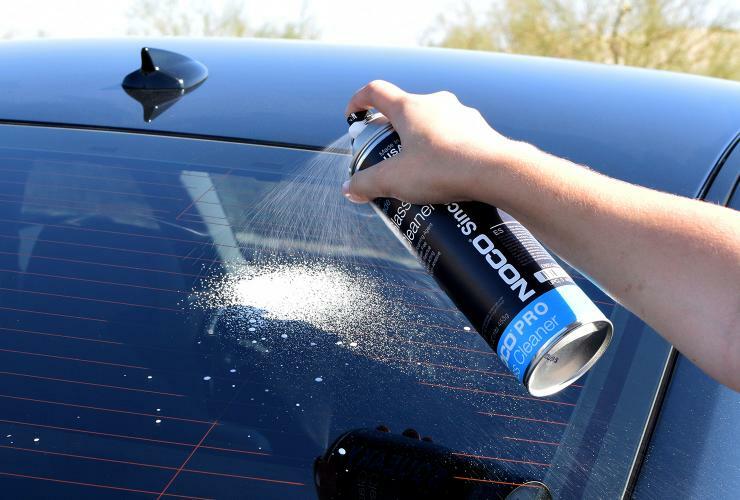 The sun will quickly dry water and solutions on your paint, leaving behind unsavory spotting. Let’s start with the exterior, beginning with the basic wash. The common car wash starts and ends with this step. Using the popular two-bucket method is one of the best ways to prevent dirt building up on your washing tool, and is further enhanced with the use of grit guards. 1.) Fill up the two (2) five-gallon buckets with water. For those looking for extra safe cleaning, add the grit guards to the bottom of buckets to collect dirt and grime stored on the washing tool. One of the buckets will be used for rinses, and the other will be used exclusively for the soap. Follow the soap’s label for the proper dilution ratio, and be sure to foam it up with the water jet. 3.) Put your washing mitt into the soapy bucket, and wash a single panel of the vehicle. Start from the top of the panel and move down. Note: Use side-to-side motions while rubbing your vehicle, instead of circular. There is always a risk of scratching the paint if debris gets onto your cloth or mitt, but a straight scratch is 10-times easier to remove than a circular one. 4.) Dunk the dirty wash mitt into rinsing bucket. If you have a grit guard, rub against it to remove excess dirt. Remove the mitt, and squeeze out the water. 5.) Repeat steps 3 and 4 for the entire vehicle, and rinse it down with the hose to remove all of the soap. 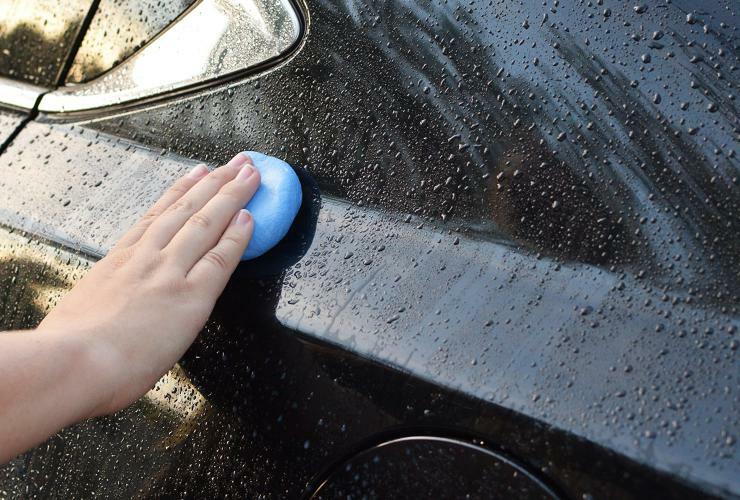 An often overlooked step in the beginner detailing process is using a clay bar. Clay is used to remove contaminants like dust, bugs, tar, and others. It also leaves behind a smooth finish, allowing for wax to better adhere to your vehicle. Warning: Dropping the clay bar renders it useless. It will pick up anything it touches, and you would be rubbing whatever was on the ground over your vehicle. 1.) While the car is still wet, spray quick detailer to lubricate the first panel. 2.) With a kneaded and stretched piece of clay, move from side-to-side over the panel. Be sure to add more lube as needed, as the clay should be freely gliding over the surface. Not enough lubricant can result in the paint marring from the clay. 3.) Continue to move the clay across the panel until it feels much smoother. You may also be able to notice that it is gliding more quietly. Wipe off the lubricant and move onto the next panel. 4.) Be sure to fold over the clay to a clean surface, as rubbing contaminants from other parts of the vehicle would be counterproductive. If the clay has no clean surfaces left, it is time to ditch it for a new one. 5.) Once every panel is clayed and dried, it is time for the wax. If your bar is still clean, be sure to save it for the wheels or your next detail. Ahh the ole wax-on, wax-off. If Mr. Miyagi taught us anything, it is the importance of a good wax. “Waxing your car” is the most frequently used term in the auto detailing industry. After a fresh coat of wax, your vehicle will not only be protected from the elements, but also have a deep and rich shine that will surely turn heads. 1.) 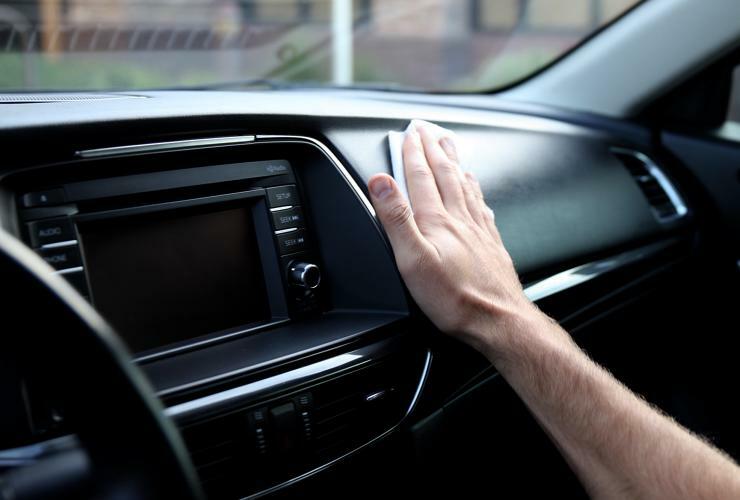 Make sure your vehicle is out of direct sunlight, and its metal panels are not hot to the touch. Additionally, double check that the vehicle is completely dry. 2.) Put a dime-sized amount of wax on your applicator pad, and evenly buff it onto the surface. Wax goes on in very thin layers, so you do not to use large globs. 3.) Covering one panel at a time, be sure to move in side to side motions. Be careful to avoid gaps between panels, hinges, badges, and other areas wax may get caught. Removing wax from these areas is a preventable step if the application is done with care. 4.) 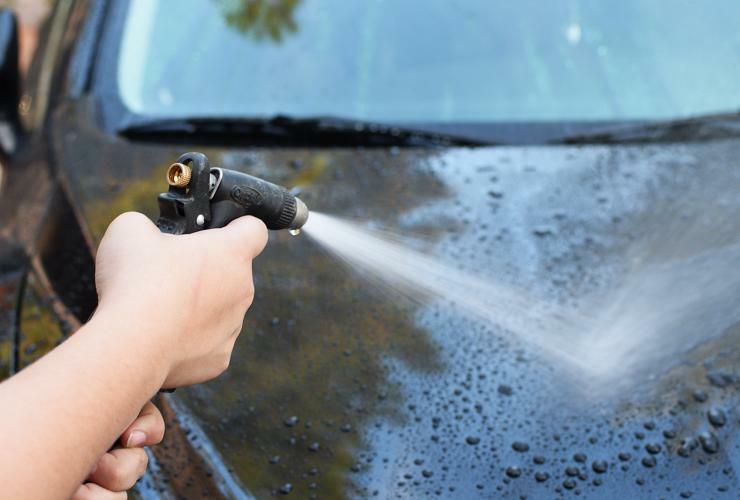 Once the vehicle’s paint is completely covered, you should’ve notice by now that the wax has turned to a slight haze. This is a sign that the wax has cured, but be sure to check the product’s label for proper curing times. 5.) 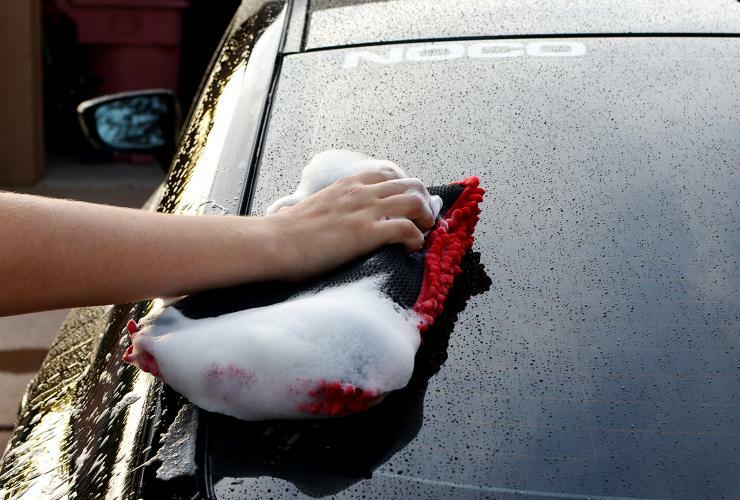 Buff out the cured wax with a microfibre cloth, once again using side-to-side motions. It is best to work moving around the car, starting on the panel where you first applied that wax. After buffing you will be greeted newly shiny surface. Be sure to check everywhere on the vehicle and remove all the wax. Bonus: You can wax your headlights in order to prevent early hazing. This is a very important step if you live in a climate with harsh sun. 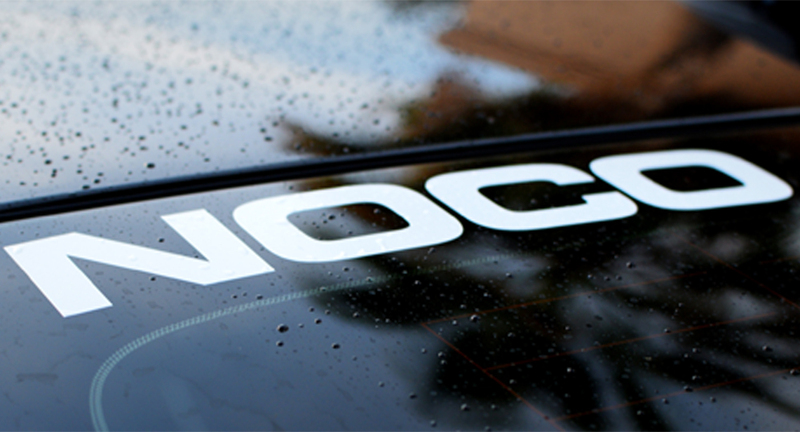 Cleaning your vehicle’s windows has never been easier with NOCO’s professional grade foaming cleaner: Squeaky. 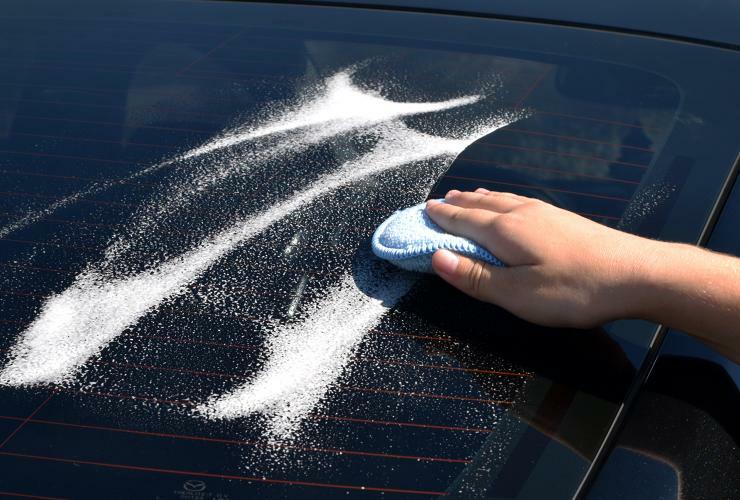 Squeaky Glass Cleaner instantly lifts and cleans the most difficult dirt and grime, without leaving behind drips or streaks. 1.) Spray Squeaky onto the window, evenly misting the foam over the glass. 2.) Once the window is fully covered, use a microfibre cloth to remove the dirt and grime. 3.) Using a clean microfibre cloth polish the window, leaving behind an invisible finish. 4.) Repeat these steps for the in and outside of the remaining windows on your vehicle. Keeping your tires and rims clean is an often overlooked step in the cleaning process. Nothing looks better on a freshly waxed car than sparkling rims and shiny tires. 1.) Using the two-bucket method from before, wash and rinse your rims and tire sidewalls. 2.) Once dried, spray a tire and wheel cleaner over the rims and tire. Some products are dedicated for both tires and wheels exclusively, but if you’re looking to save money look for a 2-in-1 spray. 3.) Let the spray cure according to the label, and wipe the rims down with a clean microfibre cloth. 4.) Repeat steps 2 and 3 for each wheel. 5.) 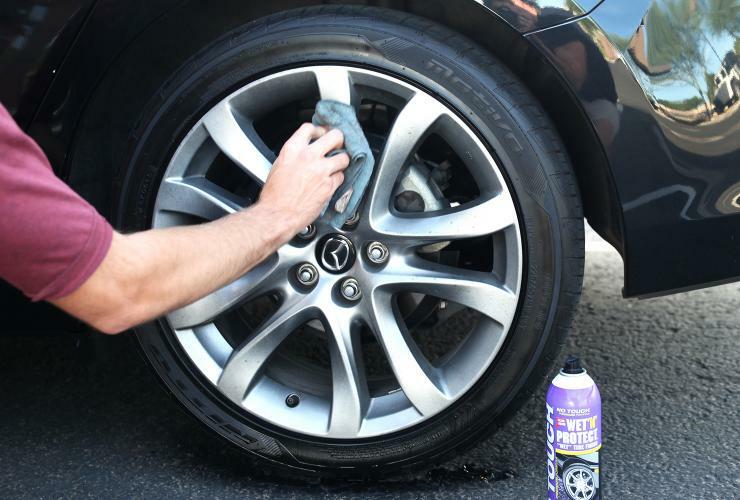 For heavily soiled or neglected rims, it is recommended to clay to remove contaminants before applying the wheel spray. You may also choose to wax your rims after cleaning for additional protection and shine. Proper detailing of the interior will keep it looking new and protected for the years to come. 1.) Remove all of the trash inside your vehicle’s cabin. 2.) Remove the floor mats/carpets. Shake them out away from the freshly cleaned paint. If you have rubber mats, clean them out with an all purpose cleaner. 3.) Vacuum the floors and seats. Don’t forget the hard to reach cracks. 4.) Spray interior cleaner onto a clean microfibre cloth, or grab an interior wipe. Clean every area of the interior. 5.) Return the floor mats if you have them, and put in a brand new air freshener if you’d like. You may apply an interior dressing solution as an extra step. This further protects your interior’s materials. Congratulations! You have completed your first basic automotive detail. We hope this guide helped you getting started, and all of that hard work has brought some new life to the physical condition of your car.